Premier League new boys West Ham have completed the signing of Sunderland's George McCartney on a two-year deal. McCartney, 31, returns to Upton Park following two previous spells at the club, initially joining in 2006, he also spent last season on loan. 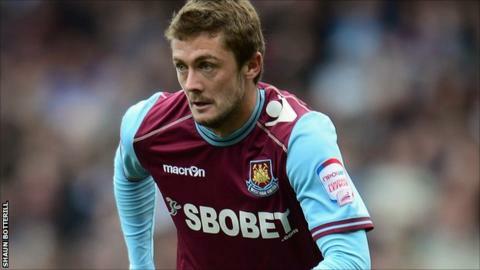 "I am delighted to be coming back to West Ham and this time on a permanent basis," said left-back McCartney. McCartney is the fourth summer signing following Jussi Jaaskelainen,Stephen Henderson and Mohamed Diame's arrival. After starting his career at Sunderland, where he won the Championship title in the 2004-05 season, McCartney moved south in 2006. The former Northern Ireland international excelled during his first stay at West Ham, scoring once in 71 appearances in all competitions. After moving back to the Stadium of Light in 2008, McCartney spent two seasons with Sunderland and one on loan at Leeds United. Having fallen out of favour at the Stadium of Light, McCartney returned to West Ham on loan in August 2011, scoring one goal in 43 appearances as the Hammers gained promotion via the play-offs. "It was great to be part of the side that won promotion for the club last season," added McCartney. "It was a fantastic way to end the campaign last year and I am really looking forward to being back in the Premier League with West Ham." West Ham begin their season at home to Aston Villa on 18 August.